This Wednesday, July 18, you can watch talented skaters show off their skills at Skating Tricks of the Trade. Both professional and amateur skaters will take over the Elmhurst YMCA’s outdoor skating rink in this exciting exhibition from 7-8 p.m. Seating is limited, so reserve your seats today. At Elmhurst Toyota, we believe this will be a fun-filled show. We encourage you to attend Skating Tricks of the Trade, a free, family-friendly event. 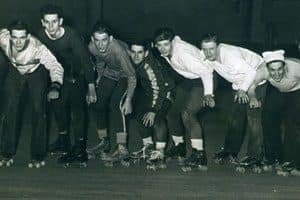 The skaters will provide a roller derby demo and entertain you with popular styles and tricks dating back to the 1940s. You’ll see spins, shuffles and jumps, as well as the popular Chicago style of JB (James Brown) skating. The YMCA will be selling food and soft drinks, with proceeds to benefit the YMCA scholarship fund. In case of rain, this event will be rescheduled for Thursday, July 26. Skating Tricks of the Trade is presented in conjunction with the Elmhurst History Museum’s latest exhibit, Chicago Rink Rats: The Golden Age of Roller Skating. So, take in the show and check out the exhibit, which runs through November 4. July 18, 7-8 p.m. Doors open at 6:30 p.m. Call the Elmhurst History Museum at 630-833-1457, email ehm@elmhurst.org or visit the website at www.elmhursthistory.org.